A regular breeding resident, migrant, and winter vagrant; the Marsh Wren was common during the Minnesota Breeding Bird Atlas (MNBBA). The Marsh Wren has a widespread distribution, from the northern portions of the Atlantic Coast to the Pacific Coast, throughout the southern Great Lakes region and the northern prairies, and patches throughout the western United States and Canada. Its highest densities are in North Dakota (Figure 1). Assigned a Continental Concern Score of 7/20 by Partners in Flight; formerly a Species in Greatest Conservation Need in Minnesota but removed in 2015. Short- to medium-distance migrant that winters along the Atlantic and Pacific Coasts, the southern United States, and Mexico. Invertebrates, primarily insects and spiders. Globular, dome nest in cattails or bulrushes; many (5 to 22) are usually built in a territory. Breeding distribution and relative abundance of the Marsh Wren in North America based on the federal Breeding Bird Survey, 2011–2015 (Sauer et al. 2017). Aptly described by Roberts (1932) as a “summer resident throughout the state; common in the southern part and on the prairies to the Manitoba line, but more sparingly represented in the marshes of the northern forested area.” Hatch (1892) also emphasized the ubiquity of this species, when he wrote, “[That] it is generally distributed over the entire State there can be no doubt.” Along the Red River valley in northwest Minnesota, he also stated that his collector, Mr. F.L. Washburn, found the species “breeding in large colonies.” Roberts reported confirmed nests with eggs from 1879 to 1929 in Cass, Grant, Jackson, Kittson, Otter Tail, and Polk Counties and in Minneapolis. Nest building, but not yet finished, was reported from Anoka County. Green and Janssen (1975) also described the Marsh Wren’s breeding distribution throughout the state as scarce in the northeastern and adjacent north-central counties, where cattail marshes are uncommon. Janssen (1987) echoed this description and identified confirmed nesting in 13 counties since 1970. These counties were all widely scattered from the extreme northwest to the extreme southwest and northeast to southern St. Louis County. Hertzel and Janssen (1998) would later add 6 more counties with confirmed nesting records since 1970 but excluded Clearwater County. The Minnesota Biological Survey (MBS) provided a broader perspective on the breeding distribution of the species in the state, though accounts were supportive of the general descriptions previously noted (Minnesota Department of Natural Resources 2017). The MBS included 893 records of the Marsh Wren, with higher concentrations west of Mower County in the south, west of Itasca County in the north-central region, and northwest to Roseau County. Scattered breeding observation locations were found northeast to southern St. Louis County; one location each in Carlton, Chisago, Cook, and Pine Counties; and one in Houston County in extreme southeastern Minnesota. The MNBBA substantially adds to the breeding observations in the state but generally confirms previous accounts: the Marsh Wren was widely distributed throughout the state but scarce in the northeastern and northern forested regions (Figure 2). MNBBA participants reported 1,663 records in 21.4% (1016/4,757) of the surveyed blocks and 25.3% (592/2,337) of the priority blocks (Figure 3; Table 1). A majority of records were of possible nesting. Confirmed nesting was reported from 48 blocks within 33 counties; one confirmed nest straddled the boundary between Redwood and Renville Counties. The species was recorded during the breeding season from every county in the state except Cook County, but as noted above, the MBS had previously found the Marsh Wren in that county. It was found at only one location in Carlton, Fillmore, and Koochiching Counties and at only two locations in Houston, Martin, Olmstead, Washington, and Winona Counties. Marsh Wren records were particularly numerous in Big Stone, Lac qui Parle, and Kandiyohi Counties. The predicted distribution map accentuated the scarcity of the species’ habitat throughout Minnesota with small pockets in the southern and western portions of its range (Figure 4). High densities were predicted at the Agassiz National Wildlife Refuge in Marshall County, at Swan Lake in Nicollet County, and in many scattered areas in west-central, southwestern, and northwestern Minnesota. The distribution of the Marsh Wren predicted by the MNBBA data was also very similar to the distribution map from the federal Breeding Bird Survey (BBS) (Figure 1), but provided greater resolution within the species’ range. The general distribution of this species in Minnesota appears to be largely intact, but the substantial loss of wetland habitat due to agricultural, industrial, and residential development has clearly reduced breeding populations in the state. This is especially true in the southern and western portions of Minnesota. This is supported by previous atlas observations throughout many other parts of the species’ range, including Michigan (Brewer et al. 1991; Chartier et al. 2013) and Ontario (Cadman et al. 2007). Additional evidence was noted by Kroodsma and Verner (2013) in the northeastern and western United States, as well as breeding range retractions in southern Florida. Fortunately, the Marsh Wren’s breeding population is still widely distributed in Minnesota despite extensive habitat loss. Breeding distribution of the Marsh Wren in Minnesota based on the Breeding Bird Atlas (2009 – 2013). Summary statistics of observations by breeding status category for the Marsh Wren in Minnesota based on all blocks (each 5 km x 5 km) surveyed during the Breeding Bird Atlas (2009-2013). Summary statistics for the Marsh Wren observations by breeding status category for all blocks and priority blocks (each 5 km x 5 km) surveyed during the Minnesota Breeding Bird Atlas (2009-2013). Predicted breeding distribution (pairs per 40 hectares) of the Marsh Wren in Minnesota based on habitat, landscape context, and climate data gathered during the Minnesota Breeding Bird Atlas (2009-2013) using the General Linear Modeling method with an adjustment for detectability. Roberts (1932) described the species as “[at] home among the reeds, rushes, and cattails of sloughs where water is several inches deep.” Collectively, Welter (1935), Verner (1965), and Kroodsma and Verner (2013) emphasized cattail stands with scattered small patches of bulrush (Scirpus spp.) or phragmites (Phragmites australis) and cattail-sedge associations (Figure 5). They also emphasized that the species prefers the exotic narrow-leaf cattail (Typha angustifolia) over the native broad-leaf cattail (T. latifolia). The narrow-leaf cattail is native to Eurasia and is invasive, plus it hybridizes with the native broad-leaf cattail. Both cattail species can displace native wetland plants and have increased dramatically since the early 1900s (Czarpata 2005). Landscape context has been reported as important to this species. For instance, Forcey et al. (2007) and Smith and Chow-Fraser (2010) provided evidence that the Marsh Wren was less abundant near human-associated land uses in the Prairie Pothole Region of Canada. Tozer et al. (2010) found it more abundant in the eastern Great Lakes when the surrounding landscape contained more wetland. In an extensive analysis of the Great Lakes coastal region of the United States and Canada, Panci et al. (2017) found the species was best predicted at sites with less than 42% of developed land within 500 m, greater proportions of herbaceous wetlands within 500 m, and more cattail wetlands within 100 m. These overall descriptions are also supported by landscapes identified where it was recorded during MNBBA point counts (Figure 6). Marsh and wet meadows were the dominant habitats within 200 m of where the species was detected during these point counts. Typical breeding habitat of the Marsh Wren (© Gerald J. Niemi). Habitat profile for the Marsh Wren based on habitats within 200 m of point counts where the species was present during the Minnesota Breeding Bird Atlas (2009-2013). Partners in Flight (2017) estimated a breeding population of 9 million individuals in North America. MNBBA estimated a breeding population of 2.35 million adults (95% confidence interval was 1.54 – 5.31 million) based on singing males during the extensive network of point counts completed in Minnesota. Since the species is polygynous, the estimate should be considered conservative. In contrast, Partners in Flight (2017) estimated only 500,000 individuals, or 5.6% of its global population in Minnesota. Obviously, this represents a large discrepancy in population estimates for this species. The BBS, which is used to estimate populations for Partners in Flight, illustrated that the Marsh Wren breeding population is substantial in the central and western portions of Minnesota, but is especially high in the Dakotas and south-central Manitoba (Figure 1). Therefore, the size of its overall breeding population in North America likely needs reevaluation. BBS trend estimates for Minnesota indicated a stable, albeit highly variable breeding population from 1967 to 2015 among the 56 routes where the species has been recorded (Figure 7). This is consistent with stable population estimates from Manitoba and Ontario. In contrast, the Marsh Wren population has been significantly increasing in both North Dakota (3.69% per year) and South Dakota (4.45% per year), as well as for all routes completed in the United States (2.12% per year) from 1966 to 2015. Partners in Flight estimated an overall increase in the population of 168% from 1970 to 2014 (Rosenberg et al. 2016). Kroodsma and Verner (2013) emphasized that population densities vary annually and considerably by the quality of the habitat. Manci and Rusch (1988) at Horicon Marsh in Wisconsin estimated a breeding population of 13,000 singing males, with densities as high as 5.5 territories per ha in shallow-water cattail habitats. In a sample of 194 wetlands in the Great Lakes from Lake Ontario to Lake Superior, the mean number observed per occupied 15-minute unlimited distance point count was 2.6 territorial males, with a range of 1 to 24 singing males detected (Panci et al. 2017). Hence, breeding population densities can be very high in some suitable habitats. 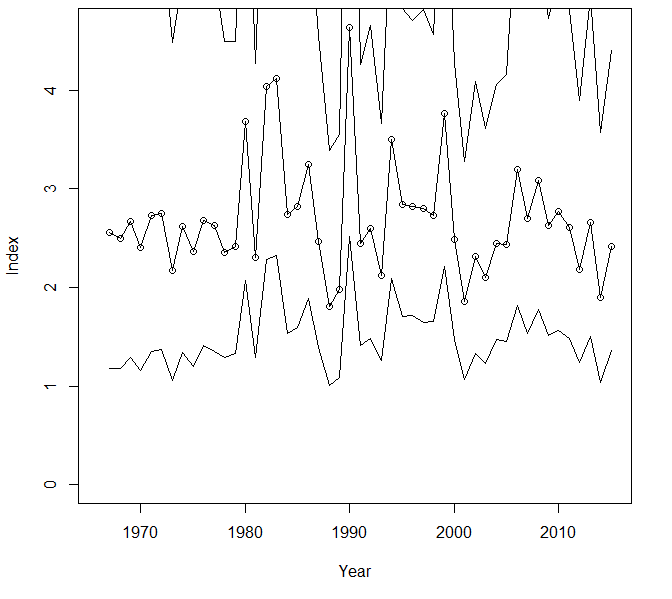 Breeding population trend for the Marsh Wren in Minnesota for 1967–2015 based on the federal Breeding Bird Survey (Sauer et al 2017). Kroodsma and Verner (2013) and Partners in Flight (2017), with its low conservation score of 7/20, emphasized minimal or no conservation concern for this species at the present time. It was formerly considered a Species in Greatest Conservation Need in Minnesota and is still a concern in some midwestern and eastern states as well as recently in Florida. Its recent population increases have largely been driven by increases in the western United States and the western Canadian provinces. Marsh Wren population concerns in the past have largely been based on the conversion of wetlands for agricultural, industrial, and residential development (Cadman et al. 1987; Chartier et al. 2013; Kroodsma and Verner 2013). Fortunately, the species has responded positively to many wetland restoration efforts (Gutzwiller and Anderson 1987; Delphey and Dinsmore 1993). Gutzwiller and Anderson (1987) and Chartier et al. (2013) identified exotic giant cane (Arundo donax) and purple loosestrife (Lythrum salicaria), respectively, as having potentially negative effects on nesting of the species, though much additional research is necessary on this topic. Langham et al. (2015) and the National Audubon Society (2015) identified the species as “climate threatened” because of a potential 74% loss of its current summer range. The shift of the Marsh Wren’s breeding range northward by 2080, predicted by the society’s climate model, is especially applicable to its midwestern range, including Minnesota, where a bulk of its breeding distribution occurs. The model also predicted the potential of the species’ winter range to expand northward. Adaptation to new habitat created by a changing climate may be possible northward into Canada, as well as continued colonization of restored wetlands, but only time will tell. Czarpata, Elizabeth J. 2005. Invasive Plants of the Upper Midwest. Madison: University of Wisconsin Press. Delphey, Philip J., and James J. Dinsmore. 1993. “Breeding Bird Communities of Recently Restored and Natural Prairie Potholes.” Wetlands 13: 200–206. Forcey, Greg M., George M. Linz, Wayne E. Thogmartin, and William J. Bleier. 2007. “Influence of Land Use and Climate on Wetland Breeding Birds in the Prairie Pothole Region of Canada.” Canadian Journal of Zoology 85: 421–436. Gutzwiller, Kevin J., and Stanley H. Anderson. 1987. Habitat Suitability Index Models: Marsh Wren. U.S. Fish and Wildlife Service Biological Report 82(10.139). Washington, DC: U.S. Department of the Interior, Fish and Wildlife Service, National Ecology Center. Manci, Karen M., and Donald H. Rusch. 1988. “Indices to Distribution and Abundance of Some Inconspicuous Waterbirds on Horicon Marsh.” Journal of Field Ornithology 59: 67–75. Smith, Lyndsay A., and Patricia Chow-Fraser. 2010. “Impacts of Adjacent Land Use and Isolation on Marsh Bird Communities.” Environmental Management 45: 1040–1051. Tozer, Douglas C., Erica Nol, and Kenneth F. Abraham. 2010. “Effects of Local and Landscape-scale Habitat Variables on Abundance and Reproductive Success of Wetland Birds.” Wetlands Ecology and Management 18: 679–693. Verner, Jared. 1965. “Breeding Biology of the Long-billed Marsh Wren.” Condor 67: 6–30. Welter, Wilfred A. 1935. “The Natural History of the Long-billed Marsh Wren.” Wilson Bulletin 47: 3–34.